Education, infrastructure development and social cohesion/nation building are the three subjects South Africa’s President Jacob has spoken about the most in his state of the nation addresses (SONAs) since 2009. So I decided, since this was his tenth, to combine all his speeches and see what subjects he’s devoted the most words to since 2009. Education was the unexpected winner with 3,353 words – about 7% of the total word count. In second place is infrastructure development (2,909 words), a key driver of the economy and job creation. Third is social cohesion/nation building (2,699 words) – which encompasses sports, arts and culture, heritage, national events, such as Human Rights Day, etc, all of which are handy sources of good news to cheer up the speech. Electricity supply/energy security was fourth (2,278 words), thanks to the tribulations at the national energy utility, Eskom. Five was jobs (2,207 words), with South Africa’s unemployment rate of 27%, that’s no surprise. Squeezing into sixth place was the economy with 1,957 words. Between 2009 and 2013 the president spoke mainly about economic recession, then from 2014 onwards it was about recovery and growth. 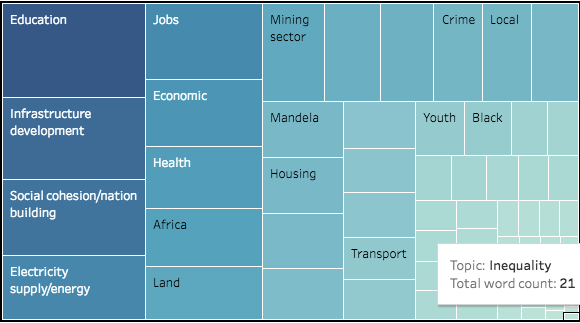 The treemap ranks the topics included in President Zuma’s 10 SONAs by combined word counts. Education was ranked second, as the president described how the “caring government” was dealing with the #Feesmustfall protests on university campuses. See A good year for education in the State of the Nation address on Passmark for more on education in the SONAs. The chart below breaks down each of President Zuma’s 10 Sonas by topic and word count.